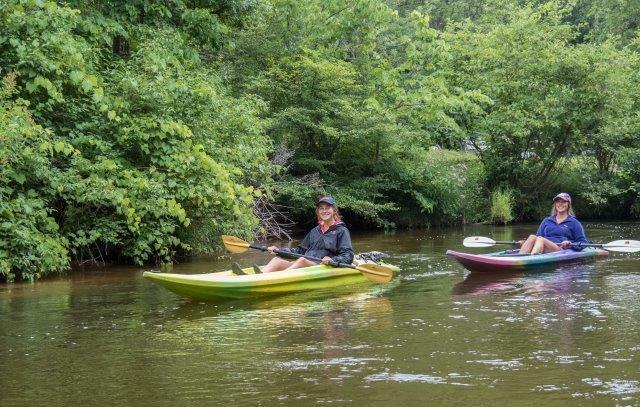 On August 3rd 2017, my friend Brittney Collins and I went on our first outing with the Traverse Area Paddle Club. We were invited by our previous assistant math teacher, Lois Goldstein. 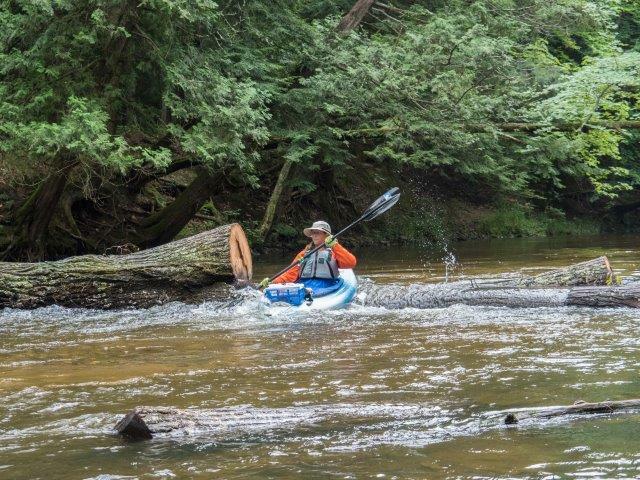 We launched our kayaks at the Pine River, just upstream from Silver Creek Campground, about an hour's drive from Traverse City. There we met up with Jackie Anderson, Doug and Lindy Barnes, Glenn Bier, John Heiam, Tracie Lord, Marlene Puska, and Jocelyn Trepte, who were all very welcoming and experienced boaters. 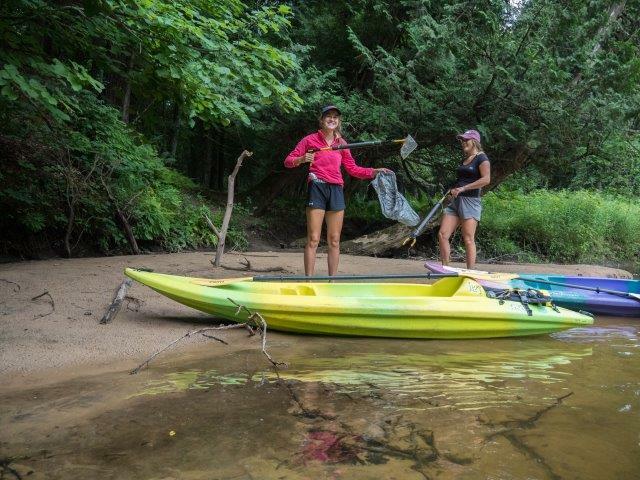 Our mission was to clean up as much trash as we could along the river's edge. 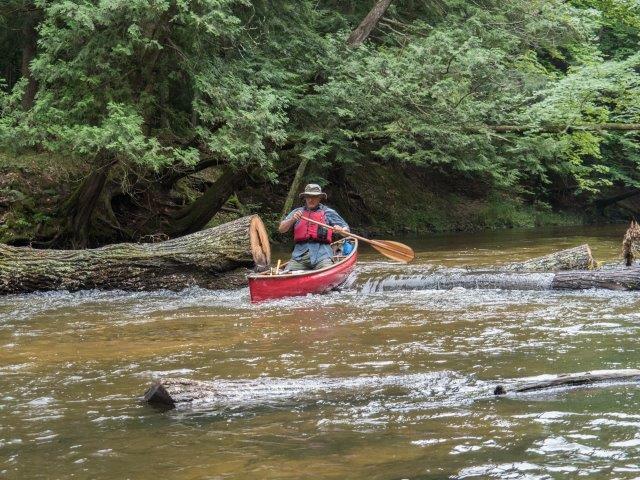 The Pine River was very twisty and turny which made stopping and collecting the trash an adventure. Brittney and I learned about eddies which was very useful to us when we needed to stop or slow down. We all stopped for lunch about an hour or so into the trip. Lunch ended with a laugh as Glenn Bier toppled into the water attempting to help the rest of us launch our boats. Afterwards, we paddled on for another hour and a half cleaning up trash before we got to our unloading point. The most exciting piece of trash found was a deflated inner tube with handles by John and Lois. Everyone was happy to see there was not as much trash as we expected there to be. We ended the trip with a group picture, clean river, and an ice cream on the way home. Our thanks to Lois for involving us in the worthwhile project. Paddle On! 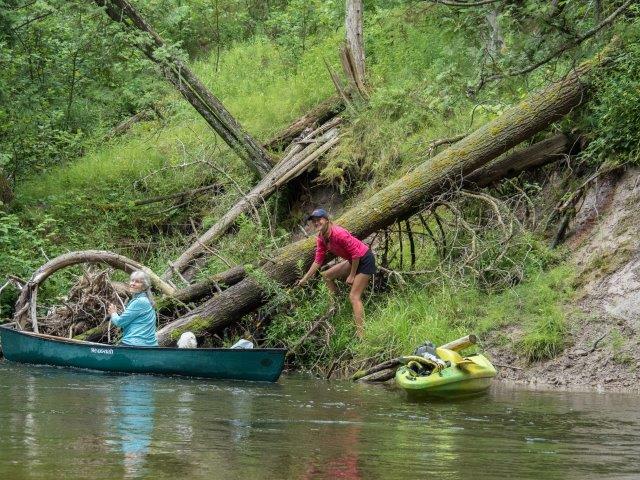 On August third I had the pleasure of joining my friend Sierra Moore, my former assistant math teacher Lois Goldstein, and the Traverse Area Paddle Club for a cleanup trip down the Pine River. It was Sierra and I’s first time kayaking on a river and we were very excited despite the nervousness and possibility of rain. We arrived at the launch location in just under an hour and met with the group. 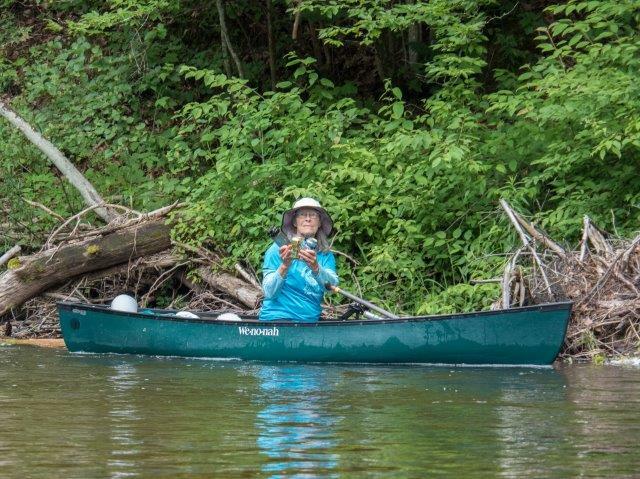 It consisted of Jackie Anderson, Doug and Lindy Barnes, Glenn Bier, John Heiam, Tracie Lord, Marlene Puska, and Jocelyn Trepte, all of whom had been paddling and doing cleanup trips for a while. They were very welcoming and helped us navigate the twisty river. 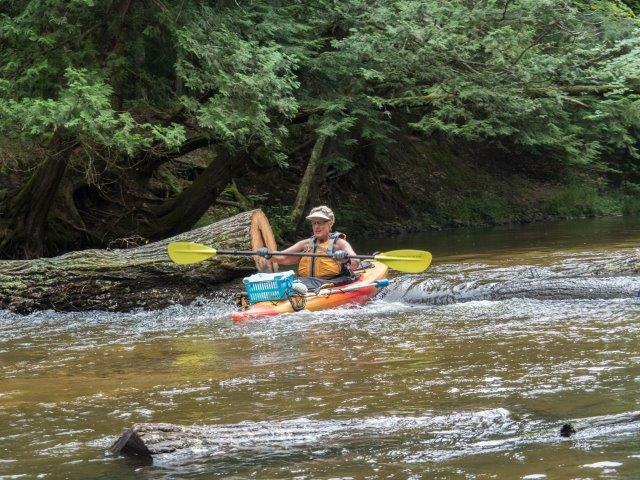 Before we launched, John Heiam gave us a brief, yet important, “how to” course on river kayaking. We learned about various safety precautions, how to use eddies to come to a stop, and the correct way to traverse across the river. After about an hour and a half, we stopped for lunch and a refresher before returning to "work". 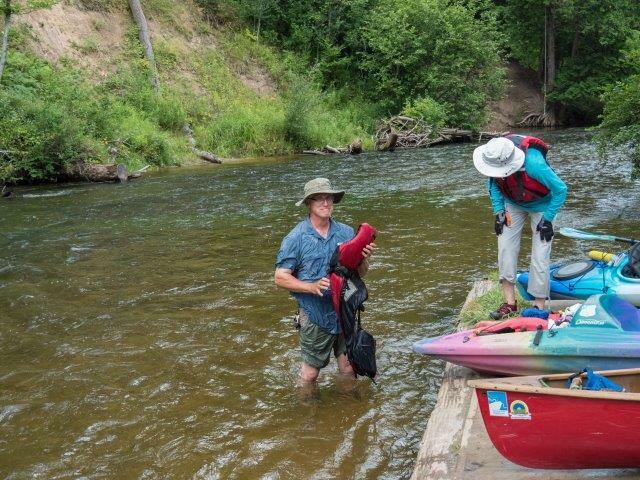 There was not a whole lot of trash, thanks to the constant work of TAPC; however as a group we still managed to snag a few beer cans, multiple flip-flops, one or two plastic bags, and even an inflatable tube! 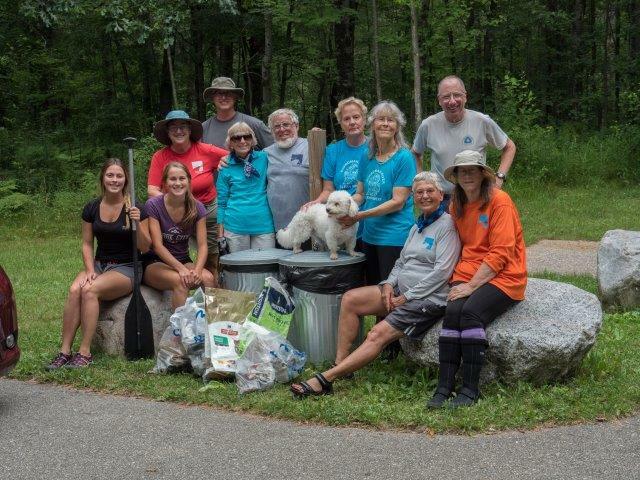 Upon arrival at Elm Flats, we unloaded our boats, collected all of the trash, and posed with it for a group photo. We ended by chatting over ice cream and reflecting upon an adventurous day. Thank you to Lois and TAPC for welcoming us as a part of the group! Glenn took an unplanned swim break right after lunch, off the dock! Lindy asked, "What were you thinking?" Fortunately there were dry clothes available. They are ready to come along again! 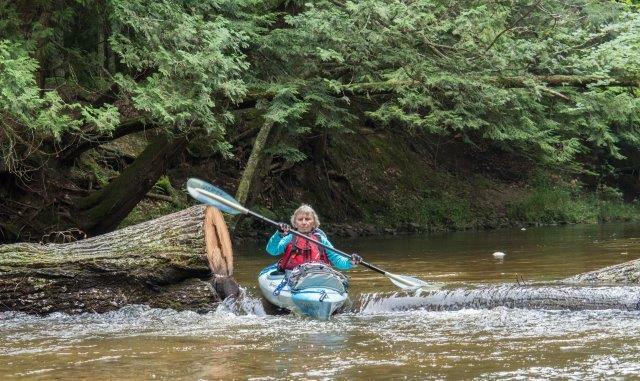 Lois tries to control a giant floating tube; her river knife came in handy!